The Hawaiian word for earth is `āina. Derived from the verb `ai, which means to eat or nourish and the suffix na, `āina literally means that which feeds, nurtures and sustains life. Terrestrially and spiritually, the `āina was traditionally associated with the feminine principle Haumea and the Hawaiian Earth-mother goddess, Papa. The ancient Hawaiians were an agriculturally oriented society with a genuine reverence, respect and aloha (love) for the `āina. The `āina was sacred, the source of sustenance and the Hawaiian’s continued existence as an indigenous people. They practiced conservation, preservation and protection of the Earth`s natural resources. They maintained balanced environmental eco systems and lived holistically with all of nature. They embraced the philosophy that if you take care of the `āina, the `āina will take care of you. Sadly, the `āina of Hawai`i today is oversaturated with people and cars and our ocean is polluted. Once abundant Hawaiian natural resources are depleted and invasive foreign species are destroying our flora and fauna. The traditional concept of “Aloha `Āina” is gone from the hearts of island residents. As Hawaiians, we have been inherently entrusted with the designated kuleana (responsibility) to serve as stewards of the land and to mālama i ka `āina (care for the Earth). 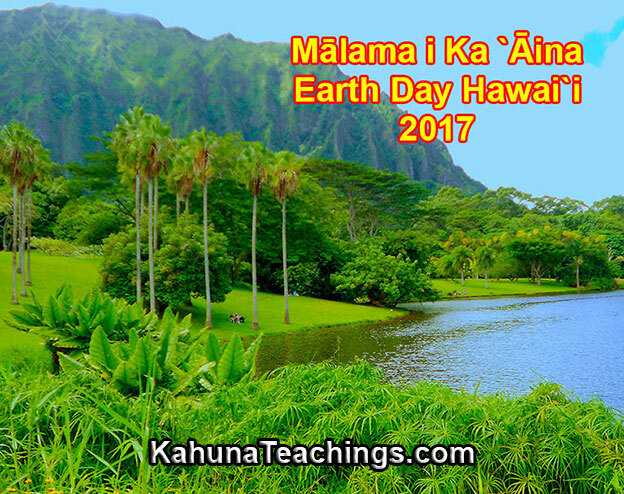 Therefore, it is important that we observe of Earth Day on April 22, 2017 and unite in support of environmental protection and preserving the natural resources of our beloved Hawaiian `āina and all the precious resources and gifts of nature all over the world – on the land, the sea and the sky. The Life of the land is Perpetuated in Righteousness.